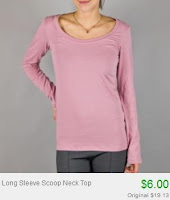 $5-$6 Ladies Short/Long Sleeved Shirts + 10% Off or Free Shipping! There's a HUGE women's apparel sale going on at Totsy right now where you can get women's short and long sleeved shirts for just $5 and $6! There is TONS more clothes on sale as well! Plus it's all guaranteed for Christmas delivery!